Foxreal FLV Converter with CUDA support is able to fast convert any encoded FLV or F4V downloaded from YouTube, Hulu, Google Video, MySpace, MSN, Facebook, etc. to MP4, 3GP,AVI, MPEG, MOV, WMV, MP3 and other popular video or audio formats for playback on kinds of media players or portable devices, such as iPad, iPod, iPod Touch 4, iPod Nano, iPhone 4, iPhone 3G, iPhone 3GS, Motorola Milestone 2, Zune, Nexus S, etc. ...... BlackBerry Torch 9800, BlackBerry PlayBook, Cowon O2, PSP, PS3, and more. With the all-in-one FLV to Video Converter, it is easy to convert FLV to MP4, convert FLV to 3GP, convert FLV to AVI, convert FLV to DVD, convert FLV to MPEG, convert FLV to MOV, convert FLV to WMV, convert FLV to MP3, etc. What' s more, it offers some powerful editing functions to improve and perfect FLV videos for best video/image effect. The FLV to Video Converter Pro 2 offers a brand-new and intuitive interface to help you easily and freely control this program and love it. This program allows you to convert FLV to H.264 FLV, FLV to H.263 FLV, FLV to SWF, and FLV to AVI encoded with VFW codec with ease as well as F4V to H.264, F4V to H.264, F4V to SWF and F4V to AVI. FLV with Alpha is supported by this tool. And it can help you convert FLV with Alpha to lossless raw video/RGBA32 (*.avi) for editing in Adobe premiere, Sony Vegas and other video editors. Qweas is providing links to Foxreal FLV Converter 1.3.3.1852 as a courtesy, and makes no representations regarding Foxreal FLV Converter or any other applications or any information related thereto. Any questions, complaints or claims regarding this application Foxreal FLV Converter 1.3.3.1852 must be directed to the appropriate software vendor. 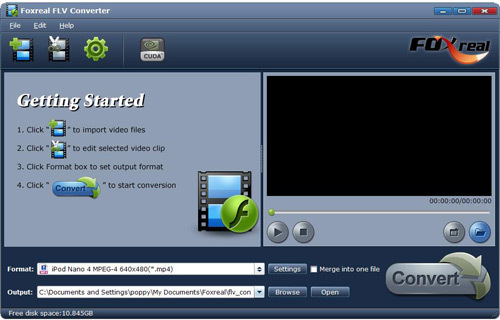 You may click the publisher link of Foxreal FLV Converter on the top of this page to get more details about the vendor.